Today I am happy that the solar powered turkeys can still move their tail feathers. I wasted an awfully lot of time trying to make a short clip of their performance but I don't know how to insert it here. Back to knitting or eating. A pox on electronic devices. What are these solar turkeys you speak of? 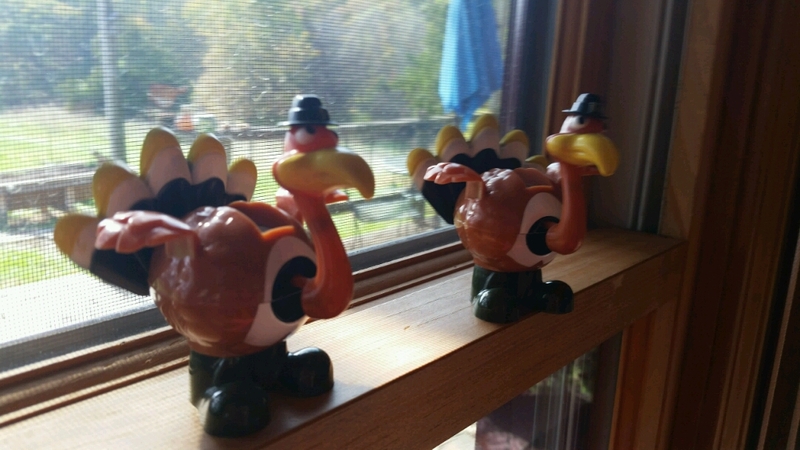 Small plastic turkeys whose tails wave when in the sun. Stuck a pic of them up now. "I wasted an awfully lot of time trying to make a short clip of their performance..."
You do make me laugh, I appreciate that. Upload the video on YouTube. I don't think you can insert it directly here.